When shooting the Milky Way galaxy, there are a few things to think about. First, you want to get as much of the Milky Way exposed as possible without blurring the stars. This a little bit depends on your lens. Many photographers use the 500 rule to determine their shutter speed. You divide your lens into 500. So, if you had a 50mm lens (500/50), you couldn’t expose longer than 10 seconds. If you had a 25mm lens, you could expose for 20 seconds – etc. In this case, Rob had a 16mm lens with a shutter speed of 15 seconds. I think he could have even exposed longer, which may have given a better histogram. However, with the people in the shot, you risk them blurring as they stand their. The truth is, there is a lot to work with in this photo. 1. Don’t over-do the grain. It will look bad. 3. Always remember your distribution. If you’re making photos for a giant wall, work hard to eliminate any noise. 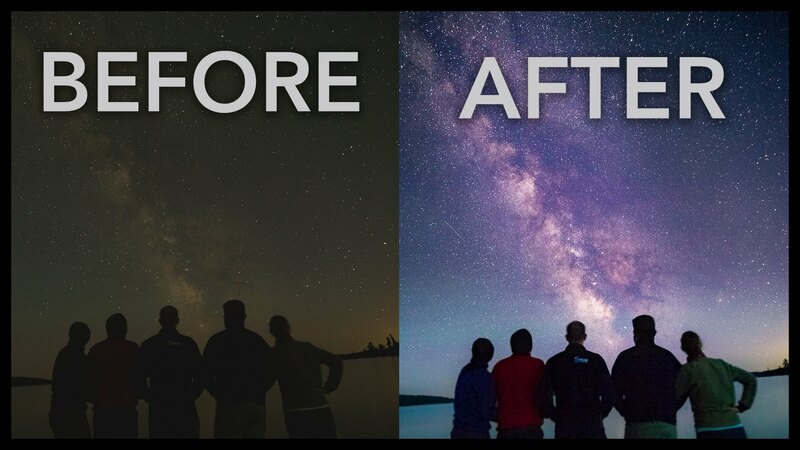 The purpose of thus tutorial isn’t to copy him exactly, but to show beginners just how easy it is to make the Milky Way “pop” out of a photo. If you’ve never tried taking a picture of the Milky Way, it may just be the push you need to give it a go.